A woman and a man engage in a discussion on a bench and then they separate. We separate with them. One camera pans to the right where Ivitch is now engaged in a heated discussion with another man. One camera stays on Davidson to the left. One of our eyes moves to watch Ivitch. One of our eyes remains with Davidson near the bench. Our binocular perception, engaged with 3D glasses, attempts to fuse the two images, creating a physical pain that can only be resolved if we close one eye, leading David Bordwell to suggest that by closing one eye, then the other, we can create our own shot/reverse-shot editing between the shots. Regardless of whether we engage in Bordwell’s task or simply look away, our eyes have to do something due to the impossibility of processing these two very different parts of a supposedly united moving image. This is one of many moments in the stereoscopic version of Jean-Luc Godard’s Adieu au langage (Goodbye to Language, 2014) that challenge our ocular perception, asking us to consider how we can rely on the veracity of visual images when their seemingly ontological truth is so fragile. When Daniel Engber began his New Yorker article on the success of both Adieu au langage and Gaspar Noé’s Love 3D (2015) at the Cannes film festival he asked “could this be the onset of a novel, highbrow age in 3-D cinema?”  The novel quality Engber identified is not merely that Adieu au langage distanced itself from the Hollywood action blockbuster’s narrative and spectacle, or that it broke the ‘rules’ of stereoscopic filmmaking with the type of painful instance mentioned above. Rather, it radically brushed up against and destabilised the drive to a Bazinian Total Cinema that characterised popular conceptions of 3D cinema. More precisely, it operated as a type of Imperfect Cinema that stood apart from the teleological imperatives of contemporary mainstream film industries concerned with greater resolution, frame rate, dynamic colour range and the implied realism these technologies offer. However, while Adieu au langage offered a respite from these concerns, it was not unique in its experimentation with stereoscopy: a visual system that can disrupt as much as it can enhance depth perception. Instead, Adieu au langage is a participant in a long history of cinematic works that test our physiological interactions with binocular perception, as much as an addition to Godard’s ‘highbrow’ cinema that has spanned more than six decades. His comments echo earlier concerns from the nineteenth century when proponents of stereoscopic photography such as David Brewster and John F. Mascher advocated making the photographic aperture and the distance between cameras replicate the biological function of the eyes. Updated to the twenty-first century, these concerns are mixed with desires for entertainment systems that achieve smooth and pleasurable viewing options through technical perfection. This provides the context for statements from Cameron such as “the whole idea is how do you make a 3-D film where you’ve removed the discomfort factor?”  It is an issue that is supported by the lengthy work undertaken by the VQMTRD Project Stereo-Film-Quality Analysis, based at Lomonosov Moscow State University, which aims to resolve problems in mainstream 3D films by analysing Hollywood films for errors and suggesting ways to correct them. The project’s various reports detect and provide remedies for, amongst other issues, excessive horizontal disparity, vertical disparity, colour mismatch and window violation. While the reports are invaluable for practitioners wishing to smooth out their stereoscopic workflow and produce comfortable viewing positions, they are part of a wider context in which industry figures such as Cameron produce unwritten rules for best practice stereoscopy: ‘rules’ that include emphasis on placing objects in positive parallax space (the space that seems to stretch away from the viewer behind the physical screen surface); the avoidance of so-called gimmick shots in which objects seem to fly towards viewers; and limited parallax separation so that audiences’ eyes do not have to work too hard to fuse the stereoscopic images. Abiding by these rules is assumed to produce greater realism, greater immersion within the text and the feeling that one is present at the scene, all within the context of an effortless viewing experience. Although there are directors and stereographers working within commercial industries that play with and violate these rules, significant portions of guides, interviews with practitioners and otherwise informative materials suggest engaging 3D images can only be achieved by working towards a technically perfect use of the technology. Popular accounts of stereoscopy’s history often form a straightforward narrative, tracing how stereoscopic images have moved towards these technical advancements and drawing a line from stereoscopic photography in the nineteenth century, through the development of anaglyph display in the twentieth century to a new technological era in the twenty-first century that includes polarised systems, glasses-free displays, extension into 3D TV and interaction with other advancements such as high frame rate. The various developments across this time period are seen to be in the service of producing increasingly higher quality images that come ever closer to replicating human processes of natural vision. Such a narrative, however, does not take into account the cyclical, discontinuous and disjointed paths that stereoscopic development has travelled. For example, the production of stereoscopic versions of the phenakistoscope in the late nineteenth century provided an early convergence between stereoscopic photography and the nascent field of moving-images long before what is believed to be the first public screening of a stereoscopic film when Edwin S. Porter demonstrated his anaglyph short in the US in 1915. Equally, William Friese-Greene’s unscreenable stereoscopic films and the large quantity of patents submitted for unproduced stereoscopic moving-image devices in the 1890s tell complex stories about the extent to which visual culture can be imagined long before it is implemented. The extensive use of polarised glasses in the 1950s, and the return of anaglyph glasses for home and some theatrical viewings later in the twentieth century, complicated an assumed hierarchy and progression of increasingly refined viewing devices, as did the use of glasses-free (autostereoscopic) systems in Russia in the 1940s that have seen new permutations in recent years. Although not widely popular, work on producing 3D television included John Logie Baird’s initial experiments in the 1940s, public broadcasts in the US in the 1980s and commercially available advanced display technologies such as the 1980s sequential field systems that worked with shutter glasses connected to a monitor or television set. While these examples mostly impacted commercial entertainment industries, it is important not to forget that there is a lengthy history of stereoscopy in educational contexts, including stereograph sets designed for classroom use in the Victorian era; stereoscopic reconnaissance photography in the nineteenth century; early twentieth-century stereoscopic slides in anatomy teaching; and 3D imaging for military training. Equally significant is the variety of non-commercial artistic works including Man Ray and Marcel Duchamp’s experimental stereoscopic motion picture in the 1920s; animator Norman McLaren’s shorts at the Telecinema event during the Festival of Britain in 1951; and the ongoing stereoscopic work by Ken Jacobs that is often screened in gallery or festival settings. Aragno’s statements, presented on Canon’s website as part of wider promotional material recognising their support for Godard’s 3D work, produce an interesting conundrum for the camera company. As a commercial manufacturer Canon is able to capitalise on the publicity gained from having an esteemed director such as Godard using its equipment. However, Aragno’s stated desire for imperfection goes against the teleological aims of the company to continuously update and improve upon its capture technology. In many ways Aragno promotes Canon by explaining that its lenses were too perfect, and in doing so inadvertently belittles its German competitor Leica, yet there is the overall sense of a playful subversion of the correct uses of these high-end technologies. When producing the film membrane in 3D cinema, the stereoscopic depth layers in the auditorium amplify and yield new tactile permutations in the visualscape. Because the stereoscopic image is able to produce the sense that different parts of the image operate on a variety of planes, we are led to feel that that textured surfaces are within touching distance or receding away from us. We are also given a greater context for the spatial configurations of objects, which in turn produces greater knowledge of their textured surfaces and how they operate as part of the fabric of what I have previously termed the hyper-haptic 3D cinema membrane. We can see this take place in Adieu au langage through the reoccurring motif of water: either as rain, damp surfaces, rivers or other bodies of liquid. This is a common preoccupation in the new digital era of 3D cinema and many Hollywood films find tenuous excuses to dunk their characters underwater or place them in other liquid occupied spaces. The appeal of visualising liquid seems to, on the one hand, lie in the way that liquid has a denser quality than the space we normally occupy and stereoscopy can help us feel the parameters of its volume. 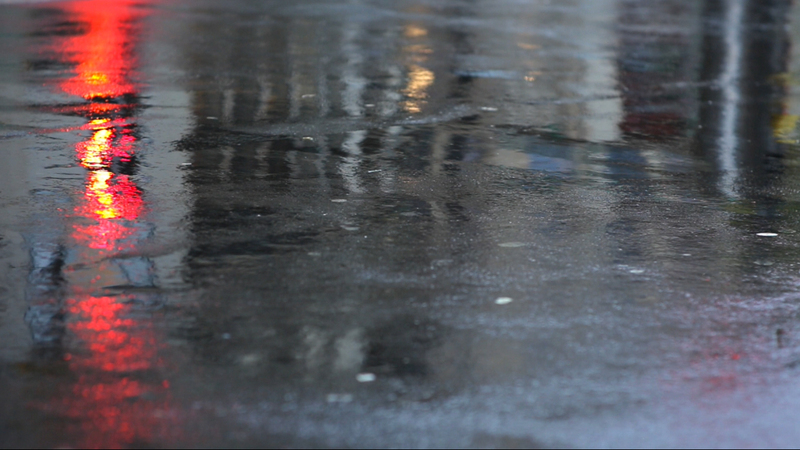 On the other hand, wet surfaces reflect light in different ways and the slightly different view that each eye receives in 3D cinema means that the reflection of light from wet three-dimensional surfaces is more acute. In Adieu au langage, the use of water does not so much allow us to feel that we are immersed in the liquid, as is often the aim in commercial 3D cinema, but rather creates textured visual fields that remind us of abstract paintings and installations. At one point we see rain affecting the surface of car windows and then a subsequent shot of the water of a river. While the rain on the windows creates abstract textures, the glossy feel of the river’s water in 3D has a different, more intense, impression than when we see it in 2D. While brain shear can be articulated in terms of physical discomfort, there are other moments in Adieu au langage that are less painful but equally work upon our physiological engagement with space and place. At one point we are presented with static shots of a book stall and then Davidson reading on a chair while Isabelle checks her phone behind him, all framed from a Dutch angle. These types of angled shots are often briefly found in Hollywood action blockbusters, particularly in the films of Michael Bay, but their extended length in Adieu au langage draws attention to the way they destabilize our vestibular placement. We are used to our inner equilibrium balancing our field of view so that horizontal alignment always seems to be in place. In 2D cinema we have come to accept that the camera can upset this alignment but in 3D cinema this is a much less sighted technique and one that unbalances our stereoscopic vision’s normal alignment with the world. Later, when a man jumps out of his car with a gun, the cameras are upside down and our field of vision is, confrontingly, turned on its head. Any immersion in the visualscape is halted as the stereoscopic membrane makes it clear that it can twist and convolute before us. In these individual shots there is, to a great extent, a unified visual field that, even with its imperfections, stretches from positive parallax space through the zero parallax point and into negative parallax space. In another startling moment, however, that reminds us of the diverging camera scenes previously discussed, the stereoscopic visual field is fragmented. We see a woman drink from a cup of water and we seem to be seeing the stereoscopic image laid bare. Rather than one three-dimensional image, we are presented with two overlapping images: as if we were seeing the parallax separation sans glasses even though the glasses are still firmly fixed on our faces. In the same way that Coonley suggests brain shear can remind us of our normal stereoscopic vision, this shot reminds us of the technologies that create the overlapping stereoscopic images and the connection they have to the glasses we use to perceive them. Thus far many of the scenes I have discussed are relatively self-contained and provide a unified approach to their construction of a stereoscopic membrane, albeit one that lays its visual idiosyncrasies bare. It is only when they are understood as part of the greater fabric of the stereoscopic film that their function as both palimpsest and patchwork quilt becomes clearer. The palimpsest is first apparent at the very beginning of the film, when the red text spelling 3D in negative parallax space does not so much obscure the traditional white 2D text placed at the zero parallax point as indicate the layering of the two visual orders where neither one erases the other. 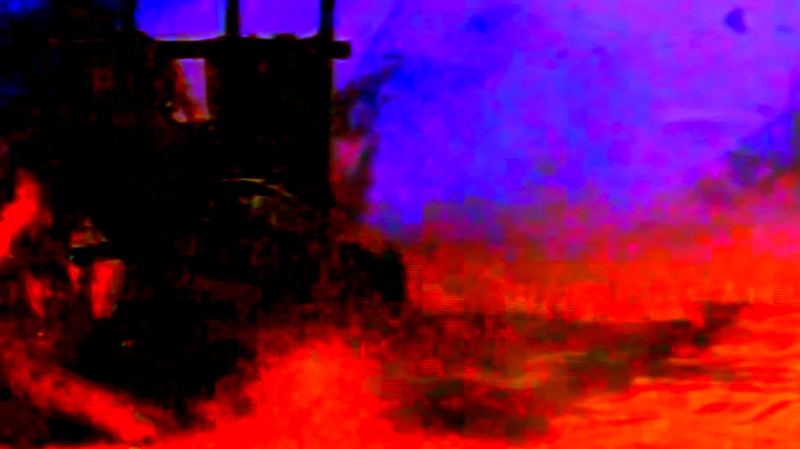 Subsequent footage, material that is appropriated from elsewhere, has distinct colour schemes, dynamic ranges and resolution levels that rub up against each other in a patchwork form: for example, the highly saturated and pixelated images of what seems to be a war zone followed by the black and white Hollywood star whose image bleeds slightly from degraded footage. The stereoscopy does not give the objects in these shots additional depth but rather situates their flatness in positive parallax space, at a further distance than normal. This has the effect of drawing our eyes into the depth of the screen space to view this material, only to be pushed back by the subsequent shot of a dog poking its nose towards us in negative parallax space. His depth rich encounter with us does not erase the significance of the older 2D footage but instead asks us to feel our way around the scenes’ different visualscapes. The low resolution, slowed down to a judder, images of the dog here, and throughout the film, can be thought of as thin images, working against the attempts by traditional 3D cinema to give images whole thickness. Their thinness is described by Deleuze as the optical image, taken up by Laura Marks to suggest that the image “defamiliarizes the cliché by severing it from its context. The resulting image looks rarefied and abstract compared to the thickness of clichéd images”. 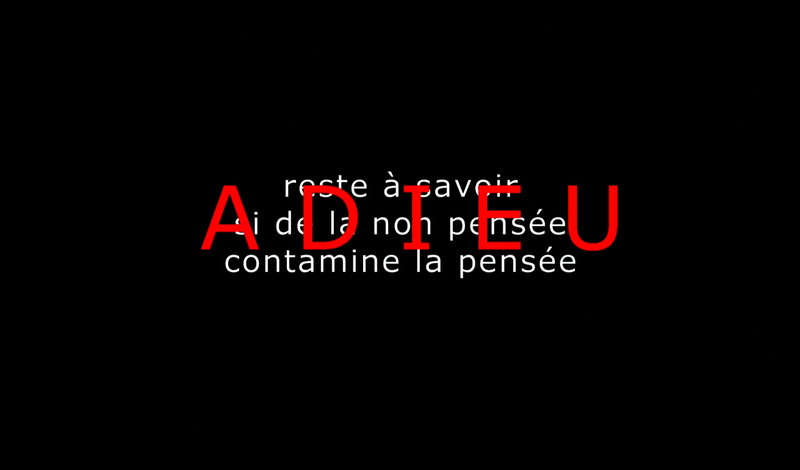 Its thinness in Adieu au langage varies the texture of the entire film, working against the visual plenitude necessary for a Total Cinema. In its denial of full visual plenitude, Adieu au langage also makes clear that there are aspects of the world that cannot be visualised, particularly the past, and posits that reducing the stereoscopic membrane to its barest threads is an effective way to address this. In this way, the discussion of Hitler begins as voice over on a black screen space. We are then provided with a mix of contemporary and historic footage, with images losing their clear substance to abstract form, but we are not presented with a stereoscopic Führer. 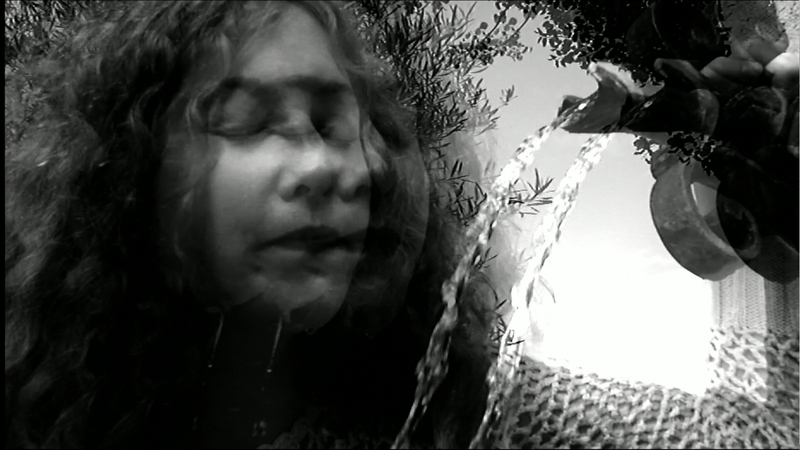 Taking these various points concerning Adieu au langage’s imperfections, frontal positioning, painful labours, and patchwork membrane together, one of the main features that places the film closer to experimental works that have played with stereoscopic visuality than to contemporary mainstream 3D film is that it would be entirely different if seen in a ‘flat’ version. Most commercial 3D filmmakers are aware that their film will also be screened in a variety of 2D formats (in the movie theatre; on DVD or Blu-ray in the home; on the airplane screen) and so produce a stereoscopic film that does not disrupt or prevent the 2D version from making sense. This does not mean that their 3D versions are equal to or can be reduced to the same visual experience as the 2D film, but that stereoscopy is often an enhancement and heightening of the visual processes that are already at work. In Adieu au langage, on the other hand, the palimpsest layering that occurs throughout the film would be unavailable in 2D and many of the images would have a completely different type of resonance. Its obscene, insistent placement of objects within our auditorium space reduces the possibility of a comfortable contemplative distance to a greater degree than other 3D films, constantly making it clear that we have to confront both the optical illusion and the work that is done by our eyes in order to produce it. As much as this film rubs up against good stereoscopic practice in the teleological tradition, it shows us that we need to take our processes of sight seriously and it asks us to consider how we can ever believe in images that are presented to us when their illusion is so fragile. It is this questioning of sight that opens up the political potential of Adieu au langage so that its Imperfect 3D can disrupt any unquestioned attempts towards the development of Total Cinema. Daniel Engber, “The Misunderstanding of 3-D”, The New Yorker, 2 June 2015, http://www.newyorker.com/culture/cultural-comment/the-misunderstanding-of-3-d.
 Ray Zone, 3-D Filmmakers Conversations With Creators Of Stereoscopic Motion Pictures (Oxford: The Scarecrow Press, 2005), pp. 143-144. Robert J. Silverman, “The Stereoscope and Photographic Depiction in the 19th Century”, Technology and Culture, Vol. 34 No. 4 (October 1993), pp. 729-756; Sheenagh Pietrobruno, “The Stereoscope and the Miniature”, Early Popular Visual Culture, Vol 9 No.3 (September 2011), pp. 171–90. Zone, 3-D Filmmakers Conversations With Creators Of Stereoscopic Motion Pictures, 148. Ray Zone, Stereoscopic Cinema and the Origins of 3-D Film (Lexington: University Press of Kentucky, 2007). Keith M. Johnston, “‘Pop-out Footballers’, Pop Concerts and Popular Films The Past, Present and Future of Three-Dimensional Television”, Convergence: The International Journal of Research into New Media Technologies, Vol. 19 No. 4, (November 2013), pp. 438-45; R.M. Hayes, 3-D Movies: A History and Filmography of Stereoscopic Cinema (London: St James Press, 1989); Ray Zone, 3-D Revolution: The History of Modern Stereoscopic Cinema (The University Press of Kentucky, 2012). Leon Gurevitch and Miriam Ross, “Stereoscopic Media: Scholarship Beyond Booms and Bust”, Public Vol. 24 No.47 (Spring 2013), pp. 72–82. Tom Gunning, “Re-Newing Old Technologies: Astonishment, Second Nature, and the Uncanny in Technology from the Previous Turn-of-the-Century”, in Rethinking Media Change: The Aesthetics of Transition, ed. David Thorburn and Henry Jenkins (Cambridge, Mass: MIT Press, 2003), p. 44. Gunning, “Re-Newing Old Technologies: Astonishment, Second Nature, and the Uncanny in Technology from the Previous Turn-of-the-Century”, 44. 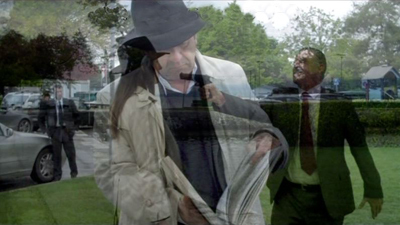 For a full overview of the many critics who hailed Godard’s innovative use of stereoscopy see David Hudson, “NYFF 2014 Jean-Luc Godard’s GOODBYE TO LANGUAGE”, Fandor, 27 September 2014, https://www.fandor.com/keyframe/daily-nyff-2014-jean-luc-godards-goodbye-to-language. André Bazin, What Is Cinema?, trans. Tim Barnard (Montreal: Caboose, 2009). Akira Mizuta Lippit, “Three Phantasies of Cinema-Reproduction, Mimesis, Annihilation,” Paragraph Vol. 22 No. 3 (November 1999), p. 213. Bruce Bennett, “The Normativity of 3D: Cinematic Journeys, ‘imperial Visuality’ and Unchained Cameras,” Jump Cut, No. 55 (Fall 2013), pp. 1–23; Carter Moulten, “The Future Is a Fairground: Attraction and Absorption in 3D Cinema”, CineAction, Vol. 89 (January 2012), pp. 4–13; Ariel Rogers, Cinematic Appeals: The Experience of New Movie Technologies (New York: Columbia University Press, 2013); Jesko Jockenhövel, “A Three-Dimensional Checkerboard: The Long Take in 3D Films”, in The Aesthetic and Narrative Dimensions of 3D Film: New Perspectives on Stereoscopy, ed. Markus Spöhrer (Wiesbaden: Springer Fachmedien Wiesbaden, 2016), pp. 55-69. Alessia Ricciardi, “The Italian Redemption of Cinema: Neorealism from Bazin to Godard”, Romanic Review, Vol. 97 No.3-4 (May-November 2006), pp. 483–500; David Sterritt, The Films of Jean-Luc Godard: Seeing the Invisible (Cambridge, U.K.; New York: Cambridge University Press, 1999); Gabor Gergely, “Jean-Luc Godard’s Film Essays of the 1960s: The Virtues and Limitations of Realism Theories”, Studies in French Cinema, Vol. 8 No. 2 (2008), pp. 111–21. Peter Wollen, “Godard and Counter Cinema: Vent d’Est”, in Readings and Writings: Semiotic Counter-Strategies (London: Verso), pp. 79-91. 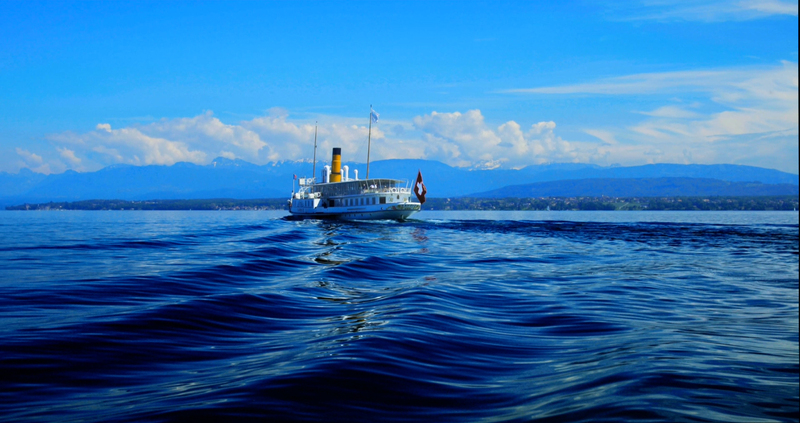 Andrew Utterson, “Practice Makes Imperfect: Technology and the Creative Imperfections of Jean-Luc Godard’s Three-Dimensional (3D) Cinema”, Quarterly Review of Film and Video, (August 2016), pp. 1–14. Julio Garcia Espinosa, “For an Imperfect Cinema”, in New Latin American Cinema, ed. M. T. Martin (Detroit: Wayne State University Press, 1997), pp. 71-82. Laura U. Marks, The Skin of the Film (Durham: Duke University Press, 2000); Vivian Sobchack, Carnal Thoughts: Embodiment and Moving Image Culture (Berkeley: University of California Press, 2004); Tarja Laine,“Cinema as Second Skin: Under the Membrane of Horror Film”, in New Review of Film and Television Studies, Vol. 4 No. 2 (August 2006), pp. 93–106. Marks, The Skin of the Film, xi-xii. Miriam Ross, 3D Cinema: Optical Illusions and Tactile Experiences (Houndmills; Basingstoke; New York: Palgrave Macmillan, 2015). Miriam Ross, “Stereoscopic Visuality Where Is the Screen, Where Is the Film?”, in Convergence: The International Journal of Research into New Media Technologies, Vol. 19 No. 4 (November 2013), pp. 406–14; Cited in Paul Dallas, “1 + 1 = 3”, Film Comment, Vol. 50 No.6 (November-December 2014), p. 39. Paul Dallas, “1+1=3: The extended cut: Goodbye to Language cinematographer Fabrice Aragno on his collaboration with JLG”, Film Comment, (November-December 2014), http://www.filmcomment.com/article/fabrice-aragno-interview/. David Ehrlich, “Goodbye To Language”, The Dissolve, 28 October 2014, https://thedissolve.com/reviews/1177-goodbye-to-language/. Ben Coonley, “3D in the 21st Century. 3D Is the Moon”, MUBI, 15 May 2015, https://mubi.com/notebook/posts/3d-in-the-21st-century-3d-is-the-moon. Ben Coonley, “3D in the 21st Century. 3D Is the Moon”, https://mubi.com/notebook/posts/3d-in-the-21st-century-3d-is-the-moon. 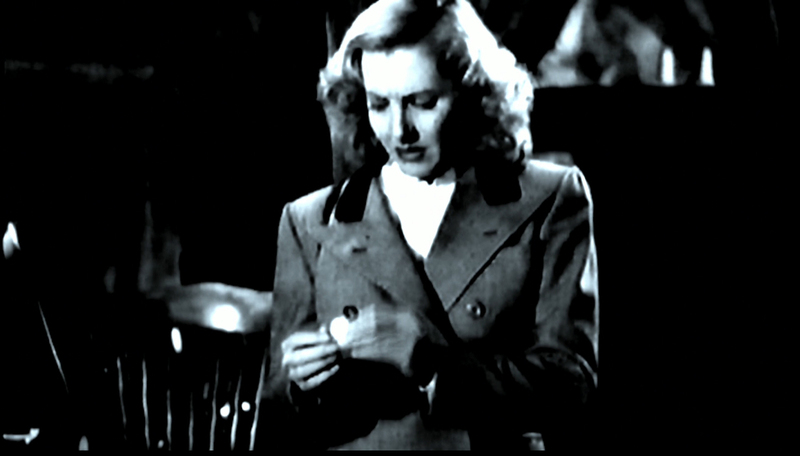 Marks, The Skin of the Film, 46.